The otherworldliness and camaraderie of those shows enchanted me. Dealers are an eccentric and social bunch; the wine started flowing an hour or so before closing or after a particularly nice sale. Mom and I usually took the opportunity to dress in vintage. She’d don a black cut velvet 30s dress paired with 20s copper-colored shoes. I was all about the 40s and my favorite find was a grey and red Lilli Ann suit jacket, which I thought was tres chic paired with a blue turban. I still have and wear that jacket and indeed, Mom’s velvet dress and copper shoes also live in my closet. One year of shows there was a ring in Mom’s display case that I coveted. Of all jewelry pieces, rings are Mom’s favorite and mine too. 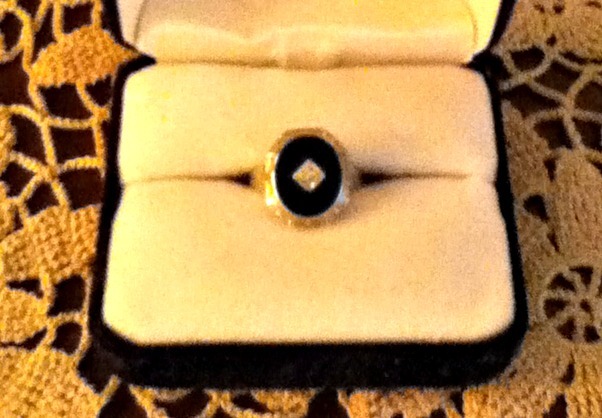 This was Art Deco – onyx with a tiny diamond in the middle set in white gold. I liked the sharp design and combination of black and white with just a touch of sparkle. That ring got a lot of attention and every time someone tried it on, I held my breath. Of course I wanted Mom to do well and sell but I also really wanted that ring on MY finger. Sometimes I’d slip it on hoping she’d say, “Oh, just keep it.” She didn’t. Me: Mom, you said you sold it. Mom: I did. I sold it to myself … for you. I have worn and loved that ring for many a year now. Thanks, Mom. Merry Christmas from Mom’s Closet.